The Russian authorities continue to take measures to restrict the imports of mineral water and wine from the former Soviet republic of Georgia. The Russian Agency for Consumption Control has recently signed another decree to ban the sales of Georgia’s Nabeglavi mineral water in Russia from May 10. 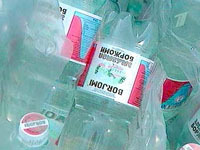 Another decree banned the imports and sales of another well-known Georgian mineral water brand, Borjomi. The head of the above-mentioned service, Gennady Onischenko, told Interfax that Nabeglavi and Borjomi mineral water was banned on the territory of the Russian Federation because the products did not meet quality and safety requirements used by Russian sanitary services. “The chemical structure of these products violates the requirements on the water salinity and the content of calcium, chlorides, magnesium and other substances in it,” Onischenko said. Gennady Onischenko added that Russian sanitary services arrested batches of 175,000 bottles of the Georgian mineral water in Moscow last week. All of the analyzed water samples were proved unsatisfactory. A Moscow court ruled to discharge more than ten tons of Borjomi water into the sewage system. Contrary to the decree issued by the Consumption Control Agency the water has not been withdrawn from retails. A court then ruled to destroy the entire batch of water. In the meantime, young members of the pro-governmental party of Georgia United Student Movement conducted an action of protest in Georgia’s capital Tbilisi. A group of young men and women gathered in front of the Russian embassy in the city, put a toilet bowl near the windows and started pouring Russian vodka and beer in it. A spokesman for the movement said that the Georgian students held the action to express their support to unique wines and mineral waters of Georgia. The action lasted for about 30 minutes. After that the people proposed a toast to Georgia and went home.